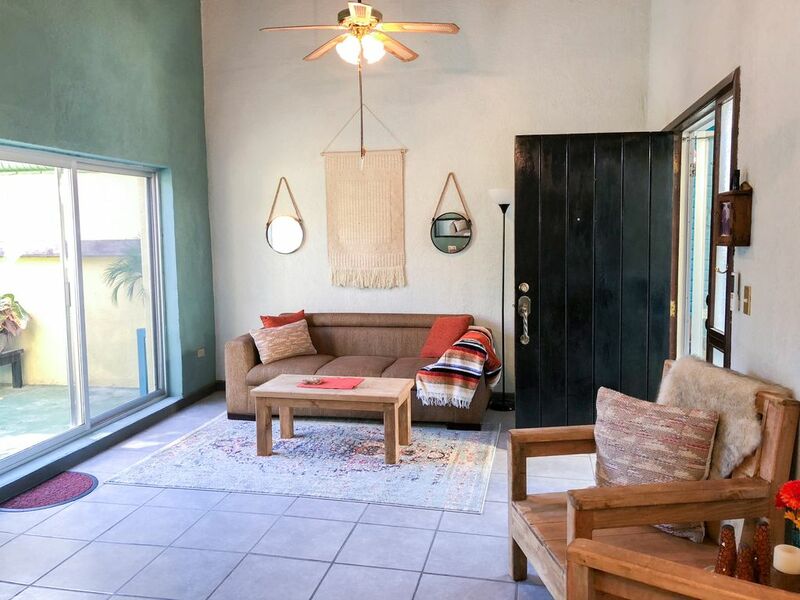 This 2bd, 2ba Mexican home is 1270 sf. with tile floors throughout and located in La Posada, one of the most desired upscale La Paz neighborhoods. It's quiet, quaint, and off the beaten tourist path. If you want to experience the best that La Paz has to offer and not just be another tourist, this is the spot for you. Private patio with ceiling fan and bistro lights is a perfect place to enjoy your morning coffee or sit down and relax over a glass of wine. Charming kitchen off the main dining / living area is fully equipped with coffee maker, blender, baking and cooking supplies, toaster oven, and microwave. The range hood, 4-burner gas stove and oven, as well as a full-size refrigerator make it almost as easy to dine in as go out. A Cooler with reusable ice packs, beach towels, travel mugs, plastic containers, and 4 beach chairs to outfit you nicely to make your trips to the beach absolutely perfect. The layout of this home is perfect for 2 couples or individuals who want to visit La Paz together. There is sufficient privacy with the en suite bathrooms in each bedroom, but great central areas with excellent seating and a set up to thoroughly enjoy togetherness. Both bedrooms have queen beds with pillow-top mattresses and individually controlled AC units. Living room and kitchen also have AC units. If you need to be connected, there is WiFi throughout the house. Local phone calls are available from the landline phone. Filtered water is provided. Just 5 blocks from the beach, 10 blocks from local gym, and 4 blocks from day usage of the beautiful pool and view at La Posada. We are also only 2 blocks from a major shopping mall with super market and cinema, 10 minutes to Airport, and only 12 blocks to El Centro and the spectacular Malecón on Bay of La Paz! There is gated parking and entrance. Neighbors are lovely and gracious. The neighborhood will make you feel like you're living here for your stay instead of just visiting! The Sea of Cortez offers some of the best diving, snorkeling, whale watching, fishing, and swimming in the world. Prices for everything in Mexico are very affordable. My husband and I are both avid scuba divers - he's a Divemaster on the way to becoming instructor. We work for a nonprofit in Oklahoma City mentoring inner-city children. Whenever we find spare time - we love to explore, dive, and travel! In late 2017, we were vacationing in La Paz for 10 days for the very first time. We decided on a trip to the Sea of Cortez on the recommendation of a fellow lifetime diver who told us about the sea lions and opportunities to dive with them. Being a huge fan of all large animals living in and under the water, I couldn't wait to go and even timed our trip so that we would be there when the sea lion pups were the most playful and interactive. Our dives in the Sea of Cortez did not disappoint! We went with an excellent environmentally-conscious company and had the time of our lives with the sea lions and were equally impressed with the wrecks and other dives we experienced. Halfway through our trip we both looked at each other and said "we love this place - it should be on our short list of places we want to own a home and settle someday!" That "someday" happened a lot sooner than we anticipated. The temporary caretaker of the B&B we stayed at was selling his house and relocating to the States. On the last night of our trip, we saw his house and we just fell in love. Within three weeks, we'd made the decision to own a little piece of Mexico and call this Casita our own. We vacationed in La Paz again with our extended family in January. Each time we fall a little more in love with this town and the people here. Our hope is that Casita de Sueños makes your dreams come true, helps you fall in love with La Paz just like it has for Jay and me, and provides a space for you to relax and experience peace and rest. We find this quaint, cozy home to be the perfect place to relax, refresh, rest, and plan our adventures. The well-stocked kitchen and large fridge make it easy to feel right at home. The bistro lights make for a fun evening just hanging out on the patio. The en suite bathrooms make this an ideal choice for two couples traveling together. Because we're divers, we've got hooks to hang gear, rinse buckets, and easy access to water. The extras we provide are things we'd like to find ourselves when renting and traveling - cooler, ice packs, travel coffee mugs, beach towels, beach chairs, and a great book of recommendations for your time in La Paz! house was ok! a bit far from the malecon, unless you have a car! was not clear that there was no TV or stereo or wash cloths! Owner Valerie wonderful as well as property management couple!! We had to grease the lock on front gate and neighborhood has lots of penned up overactive dogs that bark constantly! We enjoyed our time despite! I have taken these comments to heart and will do our best to rectify for future guests. We have washcloths for the bathroom and the kitchen so I will make sure the housekeeper places those in appropriate (and visible) locations. We do recommend a car or budgeting for Uber (it's just a few USD to get to the Malacon) so I appreciate that reference for future guests too. We do not yet have plans to get a stereo or tv (although high-speed wi-fi is provided) but would ask future guests to inquire if that has changed. Ruhige Lage, geschmackvolle Einrichtung, sehr zu empfehlen.